In Private Households during the Regency, the lord and lady of the manor took great pride in employing chefs of great renown. The most influential great French chef of the time was Marie-Antoine (Antonin) Carême (8 June 1784–12 January 1833), the one time head chef to the Prince Regent. 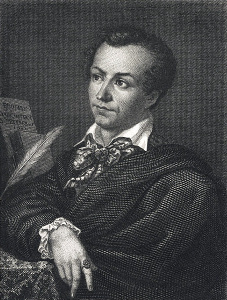 Marie-Antoine Carême was an early practitioner and exponent of the elaborate style of cooking known as grande cuisine, the “high art” of French cooking: a grandiose style of cookery favored by both international royalty and by the newly rich of Paris. Carême is often considered as one of the first internationally renowned celebrity chefs. Royalty and noblemen throughout Europe courted Carême. Carême’s history was recorded by the French novelist and gastronome, Alexandre Dumas père, who relates how Carême was the sixteenth child of a stonemason. Abandoned by his parents at the age of 11 in Paris in 1794, at the height of the French Revolution, he worked as a kitchen boy at a cheap Parisian chophouse in exchange for room and board. In 1798, he was formally apprenticed to Sylvain Bailly, a famous pâtissier with a shop near the Palais-Royal. The post-revolutionary Palais Royal was a high profile, fashionable neighborhood filled with vibrant life and bustling crowds. Bailly recognized his talent and ambition. By the time he was prepared to leave Bailly, he could stipulate that he should be free to leave his new employer when a better offer came along. He opened his shop, the Pâtisserie de la rue de la Paix, which he maintained until 1813. Carême gained fame in Paris for his pièces montées, elaborate constructions used as centerpieces, which Bailly displayed in the pâtisserie window. He made these confections, which were sometimes several feet high, entirely out of foodstuffs such as sugar, marzipan, and pastry. He modeled them on temples, pyramids, and ancient ruins, taking ideas from architectural history books that he studied at the nearby The Bibliothèque nationale de France, thanks to the enlightened attitude of his first employer Bailly. He is credited with the inventions of gros nougats and grosses meringues, croquantes, made of almonds and honey, and solilemmes. He did freelance work creating pieces principally for the French diplomat and gourmand Charles Maurice de Talleyrand-Périgord, but also other members of Parisian high society, including Napoleon. While working on his confections at many private kitchens, he quickly extended his culinary skills to main courses. Napoleon was famously indifferent to food, but he understood the importance of social relations in the world of diplomacy. In 1804, he gave money to Talleyrand to purchase Château de Valençay, a large estate outside Paris. The château was intended to act as a kind of diplomatic gathering place. When Talleyrand moved there, he took Carême with him. Carême was sent a test by Talleyrand: to create a whole year’s worth of menus, without repetition, and using only seasonal produce. Carême passed the test and completed his training in Talleyrand’s kitchens. After the fall of Napoléon, Carême went to London for a time and served as chef de cuisine to the Prince Regent, later George IV. Returning to the continent he followed the invitation of Tsar Alexander I to come to St. Petersburg, where he lived so briefly he never prepared a meal for the Tsar before returning to Paris, where he was chef to banker James Mayer Rothschild. He died in his Paris house on the Rue Neuve Saint Roche at the age of 48, due perhaps to many years inhaling the toxic fumes of the charcoal on which he cooked. He is remembered as the founder of the haute cuisine concept and is interred in the Cimetière de Montmarte. In his first major position, Carême worked as chef de cuisine to Talleyrand who actively encouraged Carême in the development of a new refined food style using herbs and fresh vegetable, simplified sauces with few ingredients. Talleyrand became a famous host during the Congress of Vienna – when the congress disbanded, not only the map of Europe but also the culinary tastes of its upper classes were thoroughly revised. Carême studied architecture, especially classical Grecian, Roman, and Egyptian buildings. His passion for architecture showed itself in the elaborate pièces montées he created. 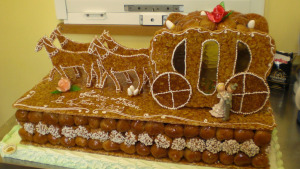 Carême’s tables were decorated with exact replicas of classical temples, bridges, etc., created from spun sugar and pastry. The centerpieces were held together with wax and poisonous glues and so were not edible. Carême’s impact on culinary matters ranged from trivial to theoretical. He is credited with creating the standard chef’s hat, the toque; he designed new sauces and dishes, he published a classification of all sauces into groups, based on four mother sauces. He is also frequently credited with replacing the practice of service à la française (serving all dishes at once) with service à la russe (serving each dish in the order printed on the menu) after he returned from service in the Russian court, but others say he was a diehard supporter of service à la française. Carême wrote several books on cookery, above all the encyclopedic L’Art de la Cuisine Française (5 vols, 1833–34, of which he had completed three before his death), which included, aside from hundreds of recipes, plans for menus and opulent table settings, a history of French cookery, and instructions for organizing kitchens. CooksInfo.com, Encyclopedia Britannica, and Wikipedia. This entry was posted in food, Great Britain, Living in the Regency, real life tales, Regency era and tagged food, Marie-Antoine (Antonin) Carême, Prince Regent. Bookmark the permalink.